Exciting news! 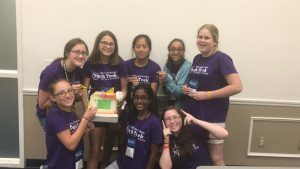 In June 2019 there will be two Tech Trek Camps, each for 48 girls. 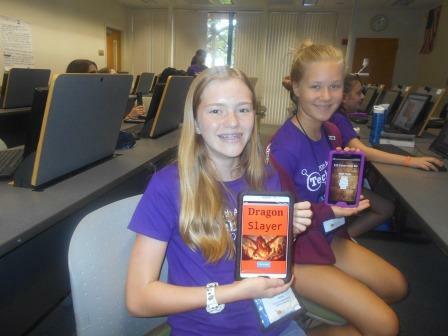 The first one will be held in DeLand at Stetson University from June 9th to June 15th. The second one will be at Florida Atlantic University in Jupiter from June 16th to June 22nd. The girls who apply will be able to choose which of the camps they prefer to attend. The camp formats will be similar but the core courses and the workshops will have some different offerings and the field trips will probably go to different locations. 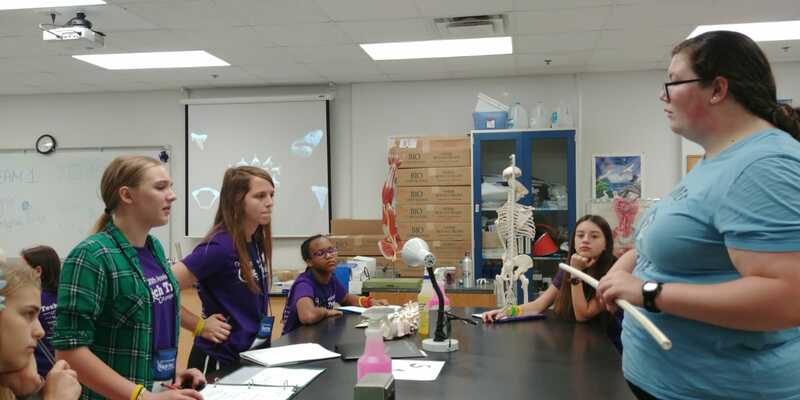 Sixty-four girls arrived at the 2018 AAUW Florida Tech Trek Camp on the Florida Atlantic University Campus in Boca Raton on Sunday June 10th. The girls attended one of four (App Inventor, Robotics, Marine Biology, and Engineering) core class beginning Monday morning. The core classes met every morning through Thursday. In the afternoon the girls attended workshops that included such topics as DNA testing, Cybersecurity, Chemistry, and Personal Finance presented by local Well-Fargo Bank personnel. By the end of Thursday afternoon every girl had attended all eight of the workshops. On Friday the entire group was to take an 1 1/2 hour bus trip to visit the Aerojet Rocketdyne site in Jupiter. Unfortunately the eagerly anticipated visit to Aerojet was cancelled due to an intestinal flu bug that made its appearance Monday morning. By Thursday morning six more had been affected. Parents were asked to pick up their daughters Thursday evening or before noon on Friday to keep the bug from spreading to any more girls and staff. The only camp event that the campers missed was the visit to Aerojet. 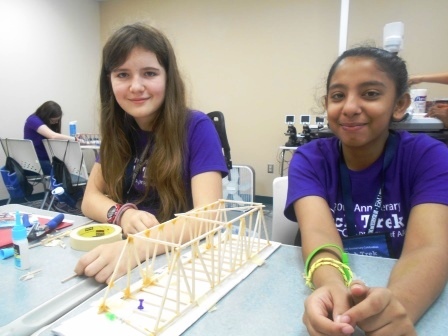 The girls in the Engineering Class worked in pairs to research, design, and build bridges out of balsa wood. The most successful ones held 20 lbs of weight. In the Robotics class the pairs constructed and programmed robots to do various tasks, to test them and then they were taught to do something more difficult. The pairs of girls in the Applications Inventors class learned to build code to create their own apps for their tablets. Each day they learned how to make their apps more complex. This is the first year the camp has offered a Marine Biology class. They spent three mornings in the lab and the 4th morning they visiting an off-campus site. Campers and all the staff members resided in one of the dorms on the adjacent campus of Florida Atlantic University. Each evening there were a variety of activities. A special dinner sponsored by AT&T was held on Wednesday where the girls dressed up for the evening dined with one of eighteen STEM professional women where they had an opportunity to talk with the women at their table. Following dinner Pat Ross, incoming AAUW Florida President, moderated the presentations and discussions about the women’s career opportunities and experiences. Dr Bernadette Russell, Palm Beach State College Boca Raton Campus Provost, spoke briefly about the college before the STEM career presentations. The girls who attended the 2018 camp described their camp experiences as “awesome”, “extraordinary”, “exciting”, “incredible” and “a unique educational experience. Federal income tax-deductible contributions for the two 2019 camps may be mailed to Tech Trek, c/o AAUW Florida Supporting Foundation, Inc, PO Box 2938, Jupiter,FL 33468. Checks should be made payable to the AAUW Florida Supporting Foundation, Inc. with Tech Trek written on the memo line. Support Tech Trek By Shopping! Go to https://smile.amazon.com to do do your amazon shopping and the amazon will donate a small percentage of your purchases excluding taxes, gift wrap, etc to the Florida AAUW Supporting Foundation, the sponsor of the Tech Trek camps. For more information about how to do this go to the donate page on this website. Every item you purchase through smile.amazon.com will help raise money for Tech Trek. AAUW has been a leader in the effort to interest more young girls in science, technology, engineering and math (STEM). The first summer Tech Trek camp was held on the campus of California’s Stanford University in 1998. Now there are ten California camps and ten additional camps scattered around the United States. Thanks to very generous sponsors and supportive donors, families pay only a $50 fee to send a girl to camp so that girls from a wide range of backgrounds are able to attend.